Exoplanet science is omnipresent on the roadmaps of all major space agencies and ground-based observatories, and continues to drive the research activities of an increasing number of scientists worldwide. One of the long-term objectives is the investigation of the atmospheric properties of a statistically significant number (>100) of terrestrial exoplanets. The key motivations are twofold - firstly to identify potential biosignatures, and secondly to understand the diversity of planetary bodies and how our Solar System fits into the larger context of (exo)planetary systems. Key steps towards achieving these objectives will be possible in the coming 10-15 years with upcoming missions such as JWST, PLATO, WFIRST or ARIEL. However, none will provide the statistical dataset of terrestrial exoplanets that is ultimately needed. Given the precision and sensitivity requirements, a space mission seems inevitable for achieving the science goals. However, what is less clear, from a purely scientific perspective, is what the optimum design for such a mission is. NASA is actively pursuing the idea of a large, single aperture UV/optical/near-infrared telescope (the HabEX and LUVOIR concepts). LIFE, however, follows a complementary approach and carries out a comprehensive re-assessment of the scientific promises and the technical challenges that a space-based mid-infrared nulling interferometer for exoplanets would represent. Concrete design studies and specific technology development are expected for the next project phases. Fig.1: Number of detectable planets (per size and stellar insolation bin) with LIFE for 320 stars within 20 pc from the Earth. In a first step, the project quantified the expected number of exoplanets that LIFE could detect. The results are summarized in two publications (Kammerer & Quanz 2018; Quanz et al. 2018). These studies were science and science yield driven and did not (yet) reassess or investigate technological aspects, but assumed the technical specifications, in particular the spatial resolution and sensitivity, as foreseen for ESA's Darwin mission. For the underlying planet population, in terms of radius and orbital period distribution, the results from NASA's Kepler mission were assumed (focusing on planets with radii <6 Earth radii). We selected 320 main sequence stars within 20 pc as target sample. Applying Monte Carlo simulations, i.e., simulating several thousand planetary systems around each target star and counting how many would have been detectable in at least one of three wavelength regimes (5.6, 10 or 15 micron) within 10'000 seconds (a bit more than 2.5 hours) of observations. The total sum of detectable planets is considered the expected planet yield of LIFE. Up to now, each of the target stars was looked at for the same amount of time irrespective of the stellar type or its distance from Earth; no optimization for the observing strategy was applied. Fig. 2: Breakdown of the ~600 detectable LIFE planets by spectral type of the host stars and wavelength regimes they are detectable within 10'000 s of integration time. It shows that, according to these simulations, LIFE should be able to detect ~600 planets the majority of which have radii between 0.5 and 1.25 Earth radii and receive between 1 and 100 times the energy that our Earth receives from the Sun (Fig. 1). Most of these planets orbit F, G or K stars, but ~150 are also detected around the low-mass, red M dwarf stars (Fig. 2). Also, the analyses show that ~460 planets (i.e, ~75% of the detectable population) are detected in at least 2 wavelength regimes that we considered; the majority of these object is even detected at all three regimes (Fig. 2). In our publications we compared these numbers to those expected for a large aperture optical/near-infrared space telescope with a primary mirror of D=12 m. We assumed this instrument can detect point sources 1e-10 times fainter as close as 2 lambda/D from the host stars. In contrast to LIFE, such a mission would detect the reflected stellar light rather than the planets' thermal emission. With ~550 detectable planets such a mission would show a comparable, but lower, planet yield. Importantly, only ~120 (i.e., 20%) of these planets would be detectable at 0.5, 1.1 and 1.6 micrometer wavelengths; 330 (60%) would be detectable at 0.5 micron, but not at longer wavelengths. Fig. 3: Model spectra for Venus, Earth and Mars including main molecular features. Panel a: the planets' reflected spectra at optical and near-infrared wavelengths. Panel b: the mid-infrared thermal emission. (Figure from Kaltenegger 2017; ARAA 55, 433). In addition to larger number of detectable planets and an on average broader wavelength range where the planets can be detected, working in the thermal mid-infrared offers the advantage of having access to a larger variety of key molecules expected to be present in the atmosphere of terrestrial planets (Fig. 3). In principle, absorption features of water, carbon dioxide, methane, ozone and nitrous oxide are present in the 5-25 micron regime. 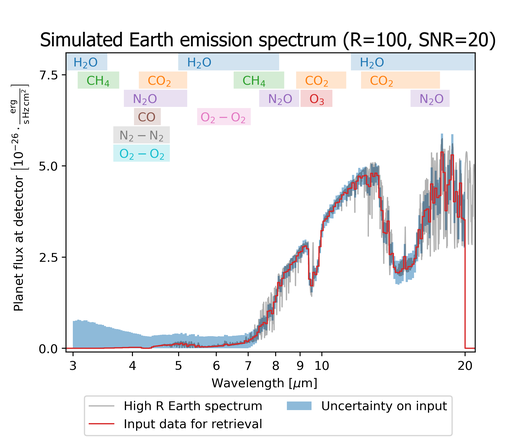 In addition, collision induced absorption of nitrogen molecules was recently observed in spectra from Earth around 4.15 micron which could offer a means to constrain the bulk mass of nitrogen dominated atmospheres. Also, in case of suitable atmospheric windows, observations in the mid-infrared may allow a direct estimate of the planets' surface temperature, a key parameter to assess the potential habitability of a planet. Finally, by combining the integrated observed flux with atmospheric models, the thermal emission provides constraints for the radius of the exoplanet. 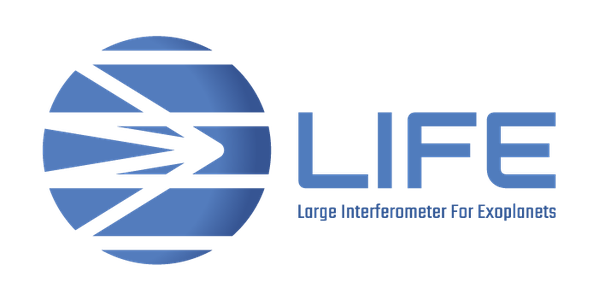 A combination of optical/near-infrared measurements, as provided by reflected light observations, and thermal mid-infrared data, as provided by LIFE, would certainly provide a more comprehensive picture of atmospheric properties than having data from only one mission. Our preliminary analysis summarized here emphasize, however, the importance and power of a mission concept like LIFE to address some of the key long-term science objectives of exoplanet research. Further refinements of and extension to the work presented here are currently ongoing.